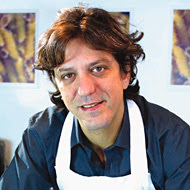 I think I am going to try and tackle my inner risotto demons this week - I don't hate it but have never particularly enjoyed eating it but would like to change that courtesy of Signor Locatelli! I have started a blog at http://dressingfordinner.blogspot.com and have put a link to your blog on there so hope you'll pop by occasionally. There ye go, chum. It wasn't so hard! :)) Looks delicious! That looks great. It's the best way to cook, pulling leftovers from everywhere into something that becomes a triumph.